Back of Beyond park owners Martin and Vicky Bowrey have been praised for their outstanding conservation. Over a quarter of a million honey bees have helped a New Forest touring park achieve a top level Gold David Bellamy Conservation Award for the third year in succession. 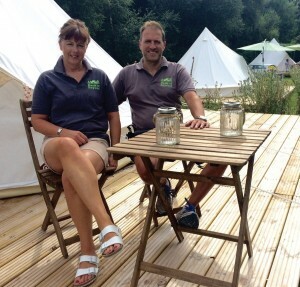 Back of Beyond Touring Park owners Martin and Vicky Bowrey have installed eight hives on their 30-acre park to try and help stem the sharp national decline in bee numbers. The initiative has been praised by botanist David Bellamy for its outstanding efforts to provide a safe haven for the bees. Back of Beyond is designated as a Site of Special Scientific Interest and Martin says that visitors to the adult-only park are thrilled at the close encounter with nature on offer: “We’re fortunate to have two wildlife lakes in the grounds, and it’s possible to spot an amazing number of species including otters and red deer,” he said. “The park is also rich in wild flowers including many high pollen-bearing blooms which bees and butterflies love – and that gave us the idea for the hives. “Experts say that lack of foraging opportunities and the use of agricultural chemicals are causing bee populations to fall, but we’ve plenty of nectar here and a total ban on herbicides.” Covering 30 acres of quiet countryside, over half of which is woodland, Back of Beyond provides 80 pitches for camping, touring caravans and motorhomes. As well as the David Bellamy award, the park has also gained a raft of other accolades including the TripAdvisor Certificate of Excellence for its consistently glowing reviews.